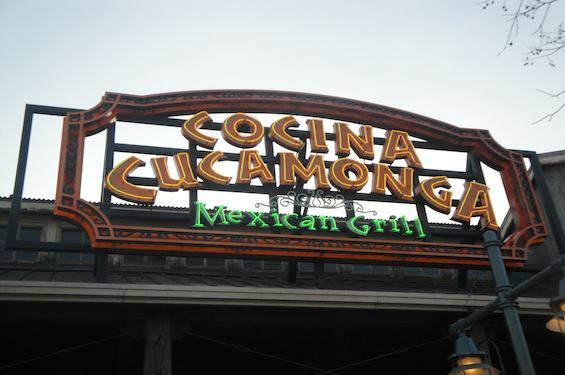 On a recent visit to Disney’s California Adventure, our Culinary Quest led us to Cocina Cucamonga Mexican Grill in the Pacific Wharf section of the park. It offers the usual Mexican items such as burritos, tacos, and tostada salads. Now, the title says a tale of TWO Mexican Restaurants. What happened? You’ll have to read on to find out! We each tried something different. I had the Carne Asada and Chicken Tamale plate for $11.49. My wife ordered the Fire Grilled Citrus Chicken at $13.49 while my son had the Kid’s Bean and Cheese Burrito for $6.49. All of the plates include beans, rice, pico de gallo, guacamole, and sour cream. Sauteed veggies can be substituted for the rice and beans if desired. We enjoyed the chicken, but the marinade didn’t scream citrus as its title indicates. It was good and moist, and the warm tortillas made at the Mission Tortilla Factory next door offered an opportunity to make some tasty soft tacos. The carne asada and chicken tamale were enjoyable as well but not outstanding enough to make an immediate trip back for seconds. As we were finishing our meal, we had a case of deja vu. Hadn’t we seen most of this menu somewhere else before? 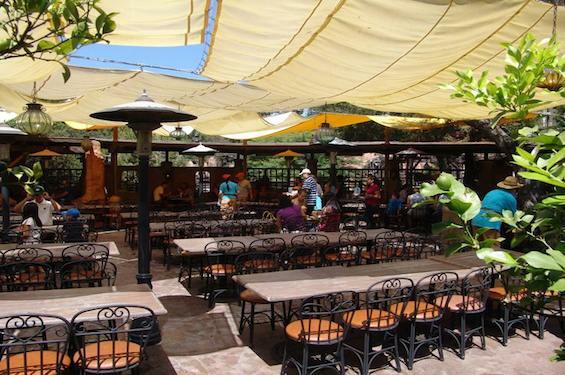 We rushed over to Disneyland Park to take a look at their Mexican restaurant, Rancho Del Zocalo. It was all making sense now. Good day students, today we will be doing an exercise in comparing and contrasting two Disneyland restaurants. In previous Culinary Quests, we have reviewed, but today we will be fulfilling a more academic purpose. 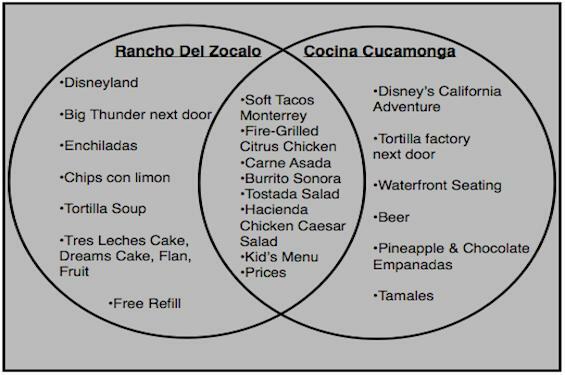 We are going to compare and contrast the two Mexican restaurants inside Disneyland and Disney’s California Adventure. Remember to take notes if necessary because there may be a quiz at the end. Let’s begin. 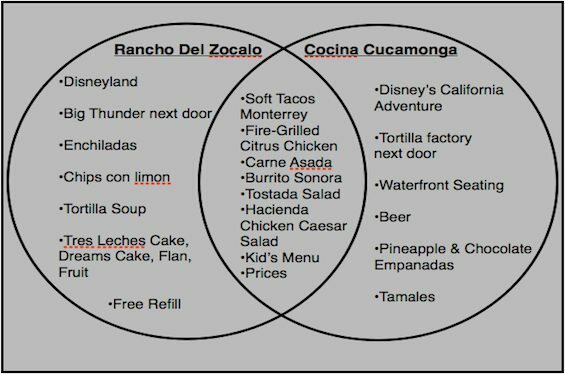 The menu items that both Rancho del Zocalo and Cocina Cucamonga have in common are the following: both offer Fire Grilled Citrus Chicken, Soft Tacos Monterrey (beef, chicken, or veggie), Burrito Sonora, Hacienda Chicken Caesar Salad, and a kid’s menu of a bean and cheese burrito or chicken soft taco. All of these items are accompanied by the same sides and are priced the same at both locations. Although they go by different names, both restaurants have the same tostada-fajita salad. Now I am going to tell you about the differences (I get to read that sentence in at least ten compare and contrast essays every year). 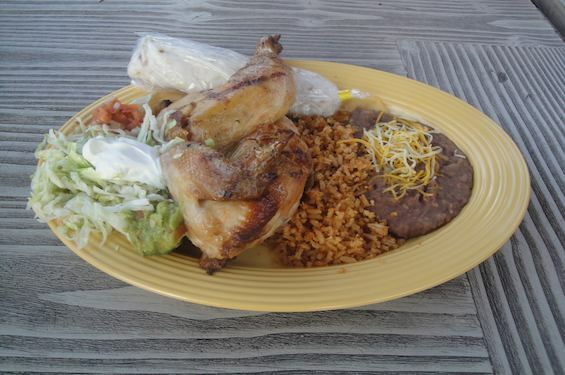 Cocina Cucamonga has a chicken tamale plate; and their carne asada combo includes a chicken tamale as well. For dessert, they have a pineapple or chocolate empanada that is not printed on the menu, but available. In terms of beverages, the sodas are ordered at the counter, and the menu includes Tecate and Dos Equis beers for $6.75 each. 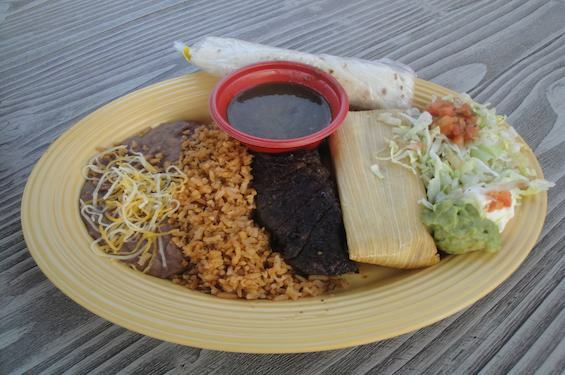 Rancho del Zocalo has a chicken tortilla soup for $5.29, and the carne asada plate includes a red chile enchilada. No tamales here, but they do have red chile enchiladas. You can also get a side of chips con limon for $2.99, plus 99 cents if you want to add salsa. The selection of desserts are around five dollars. They include fresh tropical fruit, flan, Tres Leches Cake, and Dreams Cake. 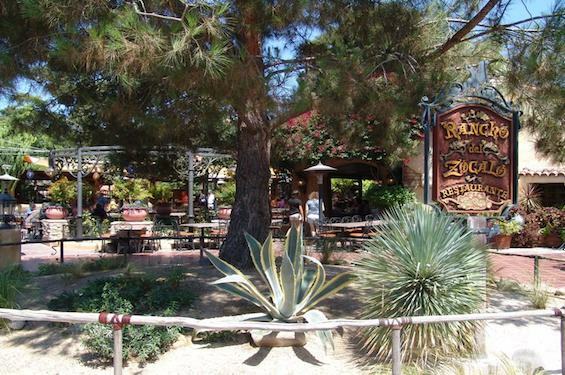 At Rancho del Zocalo, you serve your own beverages and are allowed one free refill with your receipt. As is the case in all Disneyland restaurants (except Club 33), no alcohol is sold. The restaurant is right next to Big Thunder Mountain Railroad in Frontierland. Many people love the location because you can dine in the shade while watching the I.M. Fearless roar into the station. We have eaten here many times in the past and have enjoyed its freshly made food and festive atmosphere. One thing we like about both restaurants is that the menu(s) allow you to eat relatively healthy without sacrificing taste. The portion sizes at both are generous when compared to other restaurants on property. I know many people rave about the food here, and it is good. However, being Southern California natives, we are used to great-tasting Mexican food that you can get at a taco shop down the street for a couple of bucks. Everyone has different definitions of what they consider good Mexican food. Some think of Taco Bell as great while others don’t consider it good unless it comes from the streets of Jalisco. This is Disney’s version of Mexican food, so opinions will vary. Now you will be able to make an informed decision. I have included a venn diagram for those of you students that would benefit from a symbolic representation of the information.